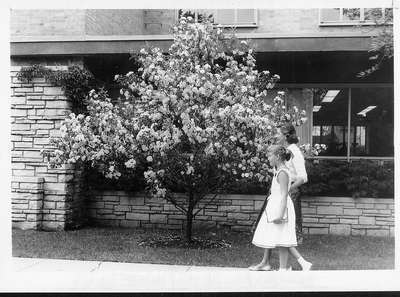 Mrs. Robert Anderson and Kristine walking near the Bechtel Crab tree planted outside the Children's Room of the Wilmette Public Library. The tree is a memorial to a 9-year-old Wilmette boy who died in July 1952. A copy of this photograph was published in Wilmette Life , Vol. XLVII, No.3, May 28, 1959. It is unknown whether the Booty Photos company still exists or whether copyright is retained by it or a successor company.